Madurai Kamban Kazhagam is a 12 year old literary organization that works towards the goal of taking the works of Kamban, one of the greatest poets of Tamil literature, to the next generation. Prof Solomon Pappiah and many other eminent scholars are at the helm of affairs in this organization. Every year, during December, this organization also dedicates a day for Avvayar and Mahakavi Bharathi. For its festival on 14 December 2014, the Kamban Kazhagam members wished to invite an eminent personality to perform at the music concert on the Avvayar- Bharathiar celebration day. During the discussions that followed, Sangita Kalanidhi Sudha Ragunathan’s name was suggested. Is it going to be possible? Will she accept our invitation-that too during the December season? These were some of our immediate thoughts. Expectations, doubts, anticipations…all these ran high! Eventually when Sudhaji gave her consent it was indeed a great moment in the history of Madurai Kamban Kazhagam. On the day of the concert, when Sudhaji entered the auditorium, a spell was cast. In line with the theme of the whole function, all songs chosen by her on that day were in Tamil, with a generous share of Bharathiyar Kavidhaigal. She commenced the three hour magic with ‘Paalum Thelithenum….’ aptly reminiscing the great woman – the jewel of Tamil literature, Avvayaar. This was followed by ‘Ganapathiraayan avaniru kaalai pidithiduvom’ in ragamaligai. The raga Varali, which was interspersed in the ragamaligai, is still lingering in our ears. Then came the beautiful composition of Sudhananda Bharathiar, ‘Eppadi paadinaro….’ the lyrics extol the virtues of the great Nayanmars and other saints like Thayumaanavar. Sudhaji’s magnificent rendering of this song brought these great scholars alive, providing a glimpse into their great lives and works. As the concert progressed, we all fell into a trance. The Murugan song that she took for niraval and swaram flew like a mellifluous river. ‘Chinnajiru Kiliye Kanamma’ brought tears to many eyes. All in the audience were thinking about their beloved daughters, appreciating the great combination of Bharathiar’s lines and Sudhaji’s voice – immortalizing their simple lives. Some were immersed in ‘Pullanguzhal Kondu Varuvaan… Kannan’ in ‘Theerada Vilayaattu Pillai’ and some others were caught in the rhapsody of ‘Nalirmani Neerum, Nayampadu Kanigalum’, a Tamil translation of Bankim Chandra Chatterjee’s ‘Vande Matharam’ by Mahakavi Bharathi). Then came the ever green ‘Katrinile Varum Geetham’. 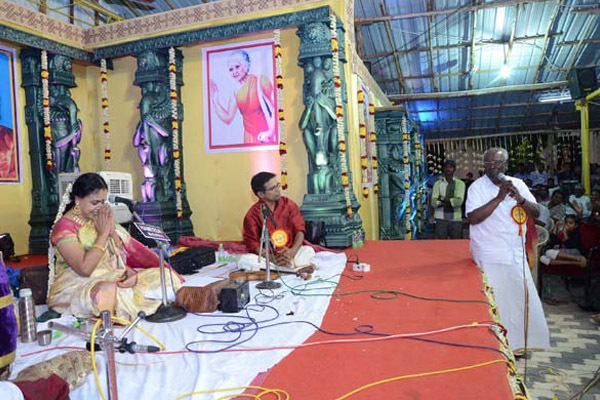 We all imagined the ‘Neelanirthu balagan’ on stage – such was the effect of Sudhaji’s mesmerizing voice. What then followed was ‘Kurai Onrum Illai ’, ‘Shanthi Nilava Vendum’ and of course the ubiquitous ‘Brahmam okatte’. Sudhaji was ably supported by Pakkala Ramdas on the violin, Tiruvarur Vaidyanathan on the mrudangam and R Raman on the morsing. The thani avarthanam simply rocked the auditorium! There is no doubt that Sudhaji has taken the audience to greater heights. Her dedication, passion for music, efforts to choose the right set of songs, altogether created a life time experience for the Madurai audience. What shall I say? Except to thank Goddess Meenakshi to have let us all be in this world where Sudhaji is singing!. Towards the end of the concert, Sudhaji requested Prof Solomon Pappiah to say a few words. ‘After all we are always seeing you speak on the television. Why not in person today..?’ were her exact words. Pappiah Sir was emotional and he retorted –‘Just like that famous charanam in ‘Theerada Vilayattupillai’ … which talks about the impact of Kannan’s kuzhalosai, Sudhaji, your voice was reverberating in the air, bringing songs soaked in nectar and I have no other words to express my feelings’. It was such a fitting tribute to the program. We will ever be grateful for the yeomen services Sudhaji in rendering for Tamil Isai. May her music take our souls to eternal bliss!